Clive Webster CEO of the Kent Catholic Schools’ Partnership and Andy Rogers, Chair of Governors at St Richard’s Catholic Primary School, congratulated pupils who took part in the P&O ‘Ferry of the Future’ Competition. Ella in Year 4 pictured here with Jerson, was the winner of the competition amongst many other pupils and schools who took part across the South East. 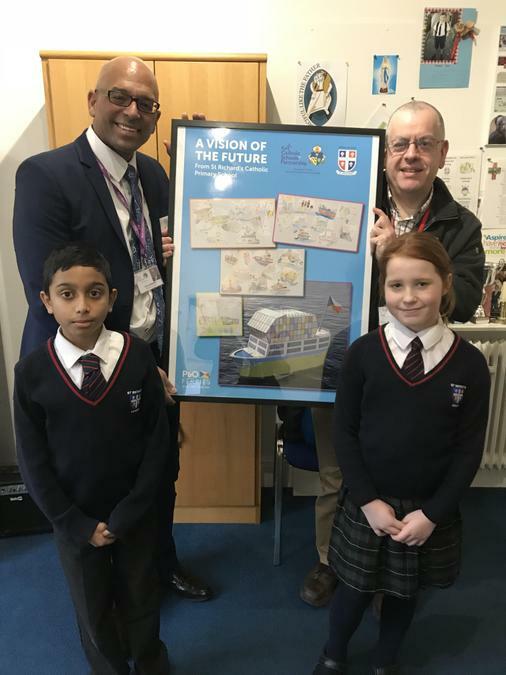 P&O commissioned a designer to produce a CGI version of Ella’s design, featured here in their poster entitled, ‘A Vision of the Future from St Richard’s Catholic Primary School’. A framed copy of the poster was presented to Clive Webster to take back to the KCSP headquarters at Barham Court.